Virgin Galactic's founder, Richard Branson, had initially suggested that he hoped to see a maiden flight by the end of 2009, but this date has been delayed on a number of occasions, most recently by the October 2014 in-flight loss of SpaceShipTwo VSS Enterprise. Branson stated that Virgin Galactic was “in the best position in the world” to provide rocket-powered, point-to-point 3000 mph air travel on Earth. In October 2017, Branson suggested that he could travel to space aboard a SpaceShipTwo within six months. On 13 December 2018 VSS Unity reached an altitude of 82.7 km (51.4 miles), officially entering outer space by US standards. Virgin Galactic was founded in 2004 by British entrepreneur Sir Richard Branson, who had previously founded Virgin Atlantic airline and the Virgin Group, and who had a long personal history of balloon and surface record-breaking activities. As part of Branson's promotion of the firm, he has added a variation of the Virgin Galactic livery to his personal business jet, the Dassault Falcon 900EX "Galactic girl" (G-GALX). The Spaceship Company (TSC) was founded by Richard Branson through Virgin Group (which owned 70%), and Burt Rutan through Scaled Composites (which owned 30%), to build commercial spaceships and launch aircraft for space travel. From the time of TSC’s formation in 2005, the launch customer was Virgin Galactic, which contracted to purchase five SpaceShipTwos and two WhiteKnightTwos; Scaled Composites was contracted to develop and build the initial prototypes of WK2 and SS2, and then TSC began production of the follow-on vehicles beginning in 2008. By July 2014, TSC was only halfway through the completion of a second SpaceShipTwo, and had commenced construction of a second WhiteKnightTwo. In July 2008, Richard Branson predicted the maiden space voyage would take place within 18 months. In October 2009, Virgin Galactic announced that initial flights would take place from Spaceport America "within two years." Later that year, Scaled Composite announced that White Knight Two's first SpaceShipTwo captive flights would be in early 2010. Both aircraft did fly together in March 2010. The credibility of the earlier promises of launch dates by Virgin Galactic were brought into question in October 2014 by its chief executive, George Whitesides, when he told The Guardian: “We’ve changed dramatically as a company. When I joined in 2010 we were mostly a marketing organisation. Right now we can design, build, test and fly a rocket motor all by ourselves and all in Mojave, which I don’t think is done anywhere else on the planet”. On December 7, 2009, SpaceShipTwo was unveiled at the Mojave Spaceport. Branson told the 300 people attending, each of whom had booked rides at $200,000 each, that flights would begin “in 2011”. However, in April 2011, Branson announced further delays, saying “I hope 18 months from now, we’ll be sitting in our spaceship and heading off into space”. By February 2012, SpaceShipTwo had completed 15 test flights attached to White Knight Two, and an additional 16 glide tests, the last of which took place in September 2011. A rocket-powered test flight of SpaceShipTwo took place on April 29, 2013, with an engine burn of 16 seconds duration. The brief flight began at an altitude of 47,000 feet, and reached a maximum altitude of 55,000 feet. While the SS2 achieved a speed of Mach 1.2 (920 mph), this was less than half the 2,000 mph speed predicted by Richard Branson. SpaceShipTwo’s second supersonic flight achieved a speed of 1,100 mph for 20 seconds; while this was an improvement, it fell far short of the 2,500 mph for 70 seconds required to carry six passengers into space. However, Branson still announced his spaceship would be capable of "launching 100 satellites every day". On May 14, 2013, Richard Branson stated on Virgin Radio Dubai's Kris Fade Morning Show that he would be aboard the first public flight of SpaceShipTwo, which had again been rescheduled, this time to December 25, 2013. "Maybe I’ll dress up as Father Christmas", Branson said. The third rocket-powered test flight of SpaceShipTwo took place on January 10, 2014 and successfully tested the spaceship’s Reaction Control System (RCS) and the newly installed thermal protection coating on the vehicle’s tail booms. Virgin Galactic CEO George Whitesides said “We are progressively closer to our target of starting commercial service in 2014". Interviewed by The Observer at the time of her 90th birthday in July 2014, Branson’s mother, Eve, told reporter Elizabeth Day of her intention of going to space herself. Asked when that might be, she replied: “I think it’s the end of the year”, adding after a pause, “It’s always ‘the end of the year’ ”. At 10.51am PST 31 October 2014, the fourth rocket-powered test flight of one of the company's SpaceShipTwo craft, VSS Enterprise, ended in disaster, as it broke apart in midair, with the debris falling into the Mojave desert in California, shortly after being released from the mothership. Initial reports attributed the loss to an as-yet unidentified "in-flight anomaly". The flight was the first test of SpaceShipTwo with new plastic-based fuel, replacing the original—a rubber-based solid fuel that had not met expectations. 39-year-old co-pilot Michael Alsbury was killed and 43-year-old pilot Peter Siebold was seriously injured. Initial investigations found that the engine and propellant tanks were intact, showing that there had not been a fuel explosion. Telemetry data and cockpit video showed that instead, the air braking system appeared to have deployed incorrectly and too early, for unknown reasons, and that the craft had violently broken apart in midair seconds later. U.S. National Transportation Safety Board Chairman Christopher Hart said on 2 November 2014 that investigators had determined SpaceShipTwo's tail system was supposed to have been released for deployment as the craft was traveling about 1.4 times the speed of sound; instead, the tail section began pivoting when the vehicle was flying at Mach 1. "I'm not stating that this is the cause of the mishap. We have months and months of investigation to determine what the cause was." Asked if pilot error was a possible factor, Hart said: "We are looking at all of these issues to determine what was the root cause of this mishap." He noted that it was also unclear how the tail mechanism began to rotate once it was unlocked, since that maneuver requires a separate pilot command that was never given, and whether the craft's position in the air and its speed somehow enabled the tail section to swing free on its own. In November 2014, Branson and Virgin Galactic came under criticism for their attempts to distance the company from the disaster by referring to the test pilots as Scaled Composites employees. Virgin Galactic’s official statement on 31 October 2014 said: “Virgin Galactic’s partner Scaled Composites conducted a powered test flight of SpaceShipTwo earlier today. [...] Local authorities have confirmed that one of the two Scaled Composites pilots died during the accident”. This was in strong contrast to public communications previously released concerning the group's successful flights, which had routinely presented pilots, craft, and projects within the same organizational structures, as being "Virgin Galactic" flights or activities of "the Galactic team". The BBC's David Shukman commented that: “Even as details emerge of what went wrong, this is clearly a massive setback to a company hoping to pioneer a new industry of space tourism. Confidence is everything and this will not encourage the long list of celebrity and millionaire customers waiting for their first flight". NTSB Chairman Christopher Hart emphasized that consideration of human factors, which was not emphasized in the design, safety assessment, and operation of SpaceShipTwo’s feather system, is critical to safe manned spaceflight to mitigate the potential consequences of human error. “Manned commercial spaceflight is a new frontier, with many unknown risks and hazards. In such an environment, safety margins around known hazards must be rigorously established and, where possible, expanded. For commercial spaceflight to successfully mature, we must meticulously seek out and mitigate known hazards, as a prerequisite to identifying and mitigating new hazards.” In its submission to the NTSB, Virgin Galactic reports that the second SS2, currently nearing completion, has been modified with an automatic mechanical inhibit device to prevent locking or unlocking of the feather during safety-critical phases. An explicit warning about the dangers of premature unlocking has also been added to the checklist and operating handbook, and a formalized crew resource management (CRM) approach, already used by Virgin for its WK2 operations, is being adopted for SS2. However, despite CRM issues being cited as a likely contributing cause, Virgin confirmed that it would not modify the cockpit display system. While Virgin has been pursuing the development of a smallsat launch vehicle since 2012, the company began in 2015 to make the smallsat launch business a larger part of Virgin's core business plan, as the Virgin human spaceflight program has experienced multiple delays. This part of the business was spun off into a new company called Virgin Orbit in 2017. Following the crash of VSS Enterprise, test flights of the replacement spaceship, VSS Unity, were set to begin after ground tests completed in August 2016. VSS Unity completed its first flight, a successful glide test, in December 2016. The glide lasted ten minutes. By January 2018, seven glide tests had been completed, and on 5 April 2018 it performed a powered test flight, the first since 2014. By July 2018, Unity had gone considerably higher and faster in its testing program than had its predecessor. On Thursday, December 13, VSS Unity reached a height of 82.7 km (51.4 miles) above the earth at speeds close to three times the speed of sound. The two pilots, Mark "Forger" Stucky and Frederick "CJ" Sturckow" earned commercial astronaut wings from the US government for the accomplishment, and brought Virgin Galactic closer to becoming the first private company to take customers to space. After a claimed investment by Virgin Group of US$100 million, in 2010 the sovereign wealth fund of Abu Dhabi, Aabar Investments group, acquired a 31.8% stake in Virgin Galactic for US$280 million, receiving exclusive regional rights to launch tourism and scientific research space flights from the United Arab Emirates capital. In July 2011, Aabar invested a further US$100 million to develop a program to launch small satellites into low Earth orbit, raising their equity share to 37.8%. Virgin announced in June 2014 that they were in talks with Google about the injection of capital to fund both development and operations. The New Mexico government has invested approaching $200m (£121m) in the Spaceport America facility, for which Virgin Galactic is the anchor tenant; other commercial space companies also use the site. In February 2007, Virgin announced that they had signed a memorandum of understanding with NASA to explore the potential for collaboration, but, to date, this has produced only a relatively small contract in 2011 of up to $4.5 million for research flights. Virgin Group in January 2015, announced an investment into the OneWeb satellite constellation providing world Internet access service of WorldVu. Virgin Galactic will take a share of the launch contracts to launch the satellites into their 1200 km orbits. The prospective launches would use the under-design LauncherOne system. Virgin Galactic and the Virgin Group are collaborating with Boom Technology in order to create a new supersonic passenger transporter as a successor to the Concorde. This new supersonic plane would fly at Mach 2.2 (similar to Concorde) for a 3-hour trans-Atlantic flight (half of standard), projected to cost $2,500–10,000 per seat (half of Concorde) for a load of 45 passengers (the Concorde held 100). It is anticipated that with the accumulation of knowledge since the design of Concorde, the new plane would be safer and cheaper with better fuel economy, operating costs, and aerodynamics. Boom would collaborate with Virgin's The Spaceship Company for design, engineering, and flight-test support, and manufacturing. The initial model would be the Boom Technology XB-1 "Baby Boom" Supersonic Demonstrator 1/3-size prototype. It would be capable of trans-Pacific flight, LA-to-Sydney in 6.75 hours, traveling at 2,335 km/h (1,451 mph). XB-1 would be equipped with General Electric J85 engines, Honeywell avionics, with composite structures fabricated by Blue Force using TenCate Advanced Composites carbon fiber products. First flight is scheduled for late 2017. Virgin Galactic has optioned 10 units. On January 24, 2019, Virgin Galactic announced they've partnered with Under Armour for fabrication of space suits for passengers and pilots of SpaceShipTwo. Under Armour will also create uniforms for Virgin Galactic employees working at Spaceport America. The full range of apparel and footwear is set to be revealed later this year, ahead of Richard Branson's inaugural commercial flight. David Mackay, former RAF test pilot, was named chief pilot for Virgin Galactic in 2011 and chief test-pilot. Steve Isakowitz was appointed as Virgin Galactic's president in June 2013. In October 2016, Mike Moses replaced Steve Isakowitz as president; Isakowitz moved to Aerospace Corp. to become President and CEO; Moses was promoted from VP Operations, and was once a NASA flight director and shuttle integration manager. The Virgin Galactic passenger list is posted on a website not associated with Virgin Galactic. The site lists space tourists who have booked a flight with Virgin Galactic. The LauncherOne system will use a Boeing 747-400 as the mothership. The B747 Cosmic Girl has been acquired for the duties. Richard Branson unveiled the rocket plane on December 7, 2009, announcing that, after testing, the plane would carry fare-paying passengers ticketed for short duration journeys just above the atmosphere. Virgin Group would initially launch from a base in New Mexico before extending operations around the globe. Built from lightweight carbon-composite materials and powered by a hybrid rocket motor, SS2 is based on the Ansari X Prize-winning SpaceShipOne concept – a rocket plane that is lifted initially by a carrier aircraft before independent launch. SS1 became the world's first private spaceship with a series of high-altitude flights in 2004. The programme was delayed after three Scaled Composites employees – Todd Ivens, Eric Blackwell and Charles May – were killed in an accident in Mojave on 26 July 2007, where the detonation of a tank of nitrous oxide destroyed a test stand. They had been observing the test from behind a chain-link fence that offered no protection from the shrapnel and debris when the tank exploded. Three other employees were injured in the blast and the company was fined for breaches of health and safety rules. The cause of the accident has never been made public. Its successor is twice as large, measuring 18 m (60 ft) in length; whereas SpaceShipOne could carry a single pilot and two passengers, SS2 will have a crew of two and room for six passengers. By August 2013, 640 customers had signed up for a flight, initially at a ticket price of $200,000 per person, but raised to $250,000 in May 2013. Tickets are available from more than 140 "space agents" worldwide. Passengers who have already submitted their deposit include Tom Hanks, Ashton Kutcher, Katy Perry, Brad Pitt, Angelina Jolie, scientist and entrepreneur Alan Finkel, Australian science journalist Wilson da Silva and the late Stephen Hawking. SpaceShipTwo is projected to fly to a height of 110 km, going beyond the defined boundary of space (100 km) and lengthening the experience of weightlessness for its passengers. The spacecraft would reach a top speed of 4000 km/h (2485 mph). On 23 May 2014, Virgin Galactic announced that they had abandoned use of the Sierra Nevada Corporation (SNC) nitrous-oxide-rubber motor for SpaceShipTwo; on 24 July 2014, SNC confirmed that they had also abandoned use of this motor for its Dream Chaser space shuttle. Future testing will see SpaceShipTwo powered by a polyamide grain powered motor. In honor of the science-fiction series Star Trek, the first ship is named after the fictional starship Enterprise. To reenter the atmosphere, SpaceShipTwo folds its wings up and then returns them to their original position for an unpowered descent flight back onto the runway. The craft has a very limited cross-range capability, and until other planned spaceports are built worldwide, it has to land in the area where it started. Further spaceports are planned in Abu Dhabi and elsewhere, with the intention that the spaceline will have a worldwide availability and commodity in the future. SpaceShipTwo's planned trajectory would achieve a suborbital journey with a short period of weightlessness. Carried to about 16 kilometers, or 52,000 ft, underneath a carrier aircraft, White Knight II, after separation the vehicle would continue to over 100 km (the Kármán line, a common definition of where "space" begins). The time from liftoff of the White Knight booster carrying SpaceShipTwo until the touchdown of the spacecraft after the suborbital flight would be about 2.5 hours. The suborbital flight itself would be only a small fraction of that time, with weightlessness lasting approximately 6 minutes. Passengers will be able to release themselves from their seats during these 6 minutes and float around the cabin. In addition to the suborbital passenger business, Virgin Galactic will market SpaceShipTwo for suborbital space science missions and market White Knight Two for "small satellite" launch services. It had planned to initiate RFPs for the satellite business in early 2010, but flights had not materialized as of 2014. In February 2014, cracks in WhiteKnightTwo, where the spars connect with the fuselage, were discovered during an inspection conducted after Virgin Galactic took possession of the aircraft from builder Scaled Composites. LauncherOne is an orbital launch vehicle that was publicly announced by Virgin Galactic in July 2012. It is being designed to launch "smallsat" payloads of 200 kilograms (440 lb) into Earth orbit, with launches projected to begin in 2016. Several commercial customers have already contracted for launches, including GeoOptics, Skybox Imaging, Spaceflight Services, and Planetary Resources. Both Surrey Satellite Technology and Sierra Nevada Space Systems are developing satellite buses "optimized to the design of LauncherOne." In October 2012, Virgin announced that LauncherOne could place 200 kg (440 lb) in Sun-synchronous orbit. Virgin plans to market the 200 kg (440 lb) payload delivery to Sun-synchronous orbit for under US$10,000,000 per mission, while the maximum payload for LEO missions is 230 kg (500 lb). Virgin Galactic has been working on the LauncherOne concept since at least late 2008, and the technical specifications were first described in some detail in late 2009. The LauncherOne configuration is proposed to be an expendable, two-stage, liquid-fueled rocket air-launched from a White Knight Two. This would make it a similar configuration to that used by Orbital Sciences' Pegasus, or a smaller version of the StratoLaunch. In 2015, Virgin Galactic established a 150,000-sq.ft. research, development and manufacturing center for LauncherOne at the Long Beach Airport. The company reported in March 2015 that they are on schedule to begin test flights of LauncherOne with its Newton 3 engine by the end of 2016. On 25 June 2015, the company signed a contract with OneWeb Ltd. for 39 satellite launches for its satellite constellation with an option for an additional 100 launches. LauncherOne will be a two-stage air-launched vehicle using Newton engines, RP-1/LOX liquid rocket engines. The second stage will be powered by NewtonOne, a 16 kilonewtons (3,500 lbf) thrust engine. It was originally intended that the first stage will be powered by a scaled-up design of the same basic technology as NewtonOne, called NewtonTwo, with 211 kilonewtons (47,500 lbf) of thrust. Both engines have been designed, and as of January 2014[update] first articles have been built. NewtonOne was tested up to a full-duration burn of five minutes. NewtonTwo made several short-duration firings by early 2014. NewtonThree is a 260–335-kilonewton (58,000–75,000 lbf)-thrust engine, and has only recently begun hot-fire tests as of March 2015[update]. More recent reports suggest that a NewtonThree will power the first stage of LauncherOne. LauncherOne will be launched from this former Virgin Atlantic Boeing 747, named Cosmic Girl. News reports in September 2015 indicate that the higher payload is to be achieved by longer fuel tanks and the NewtonThree engine but this will mean that White Knight Two will no longer be able to lift it to launch altitude. The rocket will be carried to launch altitude by a 747. The revised LauncherOne will utilize both the Newton 3 and Newton 4 rocket engines. In December 2015, Virgin announced a change to the carrier plane for LauncherOne, as well as a substantially-larger design point for the rocket itself. The carrier aircraft will now be a Boeing 747, which will in turn allow a larger LauncherOne to carry heavier payloads than previously planned. The modification work on the particular 747 that Virgin has purchased is expected to be completed in 2016, to be followed by Orbital test launches of the rocket in 2017. In 2008 it was announced that test launches for its fleet of two White Knight Two mother ships and five or more SpaceShipTwo tourist suborbital spacecraft would take place from the Mojave Spaceport, where Scaled Composites was constructing the spacecraft. [needs update] An international architectural competition for the design of Virgin Galactic's operating base, Spaceport America in New Mexico, saw the contract awarded to URS and Foster + Partners architects. In the same year Virgin Galactic announced that it would eventually operate in Europe out of Spaceport Sweden[needs update] or even from RAF Lossiemouth in Scotland. While the original plan called for flight operations to transfer from the California desert to the new spaceport upon completion of the spaceport, Virgin Galactic has yet to complete the development and test program of SpaceShipTwo. In October 2010, the 3,000 m (10,000 ft) runway at Spaceport America was opened, with SpaceShipTwo "VSS Enterprise" shipped to the site carried underneath the fuselage of Virgin Galactic's Mother Ship Eve. Virgin Galactic is not the only corporation pursuing suborbital spacecraft for tourism. Blue Origin is developing suborbital flights with its New Shepard spacecraft. Although more secretive about its plans, Jeff Bezos has said the company is developing a spacecraft that would take off and land vertically and carry three or more astronauts to the edge of space. New Shepard has flown above the Karman line, landed and been reflown to above the Karman line again. On 16 September 2014, SpaceX and Boeing were awarded contracts as part of NASA's CCtCap program to develop their Crew Dragon and CST-100 Starliner spacecraft, respectively. Both are capsule designs to bring crew to orbit, a different commercial market than that addressed by Virgin Galactic. Now-defunct XCOR Aerospace had also worked on rocket-powered aircraft during many of the years that Virgin Galactic had; XCOR's Lynx suborbital vehicle was under development for more than a decade, and its predecessor, the XCOR EZ-Rocket did actually take flight, but the company closed its doors in 2017. There have been a series of delays to the SS2 flight test vehicle becoming operational, amidst repeated assurances from Virgin Galactic marketing that operational flights were only a year or two out. The Wall Street Journal reported in November 2014 that there has been "tension between Mr. Branson’s upbeat projections and the persistent hurdles that challenged the company’s hundreds of technical experts." The company has responded that "the company and its contractors 'have internal milestones, such as schedule estimates and goals, but the companies are driven by safety and the completion of the flight test program before moving into commercial service.' Virgin Galactic’s schedules have always been consistent with internal schedules of its contractors and changes have 'never impacted flight safety'." Wikimedia Commons has media related to Virgin Galactic. ^ "Sir Richard Branson plans orbital spaceships for Virgin Galactic, 2014 trips to space". foxnews.com. ^ a b "Branson unveils space tourism jett". BBC News. July 28, 2008. Retrieved March 7, 2014. ^ "Virgin Galactic tourism rocket ship reaches space in test". San Jose Mercury News. Bay Area News Group. Associated Press. December 4, 2018. p. A4. ^ Grant Martin (4 August 2008). "Sir Richard Branson's Private Jet". Gadling. ^ "Window Seat". Window Seat. Travel Daily. 29 January 2011. ^ "Richard Branson and Burt Rutan Form Spacecraft Building Company". SPACE.com. July 27, 2005. Retrieved October 17, 2009. ^ Will Whitehorn (October 27, 2009). International Astronautical Congress 2009: Civilian Access to Space (video, comments at c. 22:00). Daejeon, Korea: Flightglobal Hyperbola, Rob Coppinger. ^ Garside, Juliette (9 October 2014). "Still looking up: former Nasa chief who now nurtures Virgin's spaceflight hopes". The Guardian. London. Retrieved 12 November 2014. ^ Allen, Nick (December 8, 2009). "Richard Branson unveils Virgin Galactic's spaceship Enterprise". The Daily Telegraph. London. Retrieved May 27, 2010. ^ Batey, Angus (June 5, 2010). "Your flight is now departing from space terminal 1: The amazing story behind Branson's Virgin Galactic project". London, UK: Daily Mail. Retrieved July 28, 2010. ^ a b Private Eye (September 2014). “Beam us up, Beardie!”, Private Eye, No. 1374, 5–18 September 2014, pg 8. Retrieved 2 October 2014. ^ Klotz, Irene (February 28, 2012). "UPDATE 1-Virgin Galactic aims to test fly ship in space this year". Reuters. Retrieved February 28, 2012. ^ "VIRGIN GALACTIC BREAKS SPEED OF SOUND IN FIRST ROCKET-POWERED FLIGHT OF SPACESHIPTWO". Virgin Galactic. May 14, 2013. Archived from the original on April 30, 2013. Retrieved April 29, 2013. ^ "Lost in Space". Sunday Times. January 26, 2014. Retrieved January 26, 2014. ^ Croucher, Martin (May 14, 2013). "UPDATE 1-Virgin Galactic aims to test fly ship in space this year". The National. Archived from the original on June 7, 2013. Retrieved May 14, 2013. ^ "New Heights in Third Supersonic Test Flight". Virgin Galactic. Jan 10, 2014. Archived from the original on 2014-04-07. Retrieved Mar 21, 2014. ^ Day, Elizabeth (20 July 2014). "Eve Branson: 'I was not saved by Kate Winslet!'". The Observer. London. Retrieved 12 November 2014. ^ Villagran, Laura (11 September 2014). "Virgin Galactic: More delays". Albuquerque Journal. Retrieved 11 September 2014. ^ Ungoed-Thomas, Jon (September 2014). “The $80m Virginauts stranded on Earth”, The Sunday Times, 14 September 2014. Retrieved 2 October 2014. ^ Porter, Tom (September 2014). “Doubts About Feasibility of Virgin Space Flights, as Branson Announces New Delays”, International Business Times, 14 September 2014. Retrieved 2 October 2014. ^ a b Shukman, David (31 October 2014). "Virgin Galactic spacecraft crash kills one". BBC News. Retrieved 31 October 2014. ^ "Virgin Galactic Makes a Switch in SpaceShipTwo's Rocket Motor". 23 May 2014. ^ "Pilot actions examined in U.S. crash of Virgin Galactic spacecraft". Reuters. 4 November 2014. ^ a b "Watch this space". Private Eye. London. 14 November 2014. p. 7. ^ "Statement from Virgin Galactic 31.10.14". www.virgingalactic.com. 31 October 2014. Archived from the original on 14 November 2014. Retrieved 12 November 2014. ^ Rose, Greg. "Virgin Galactic test flight success". virgin.com. Archived from the original on 27 November 2014. Retrieved 13 November 2014. ^ Branson, Richard (15 September 2014). "How to Train to be an Astronaut". www.virgin.com. Retrieved 13 November 2014. ^ "One pilot dead as Virgin Galactic spaceship crashes during test flight". Daily Telegraph. 31 October 2014. Retrieved 31 October 2014. ^ "Investigators Cite Inadequate Design Safeguards in SpaceShip Two Crash: NTSB staff questions if pilots fully aware of flight hazards". The Wall Street Journal. 28 July 2015. Retrieved 28 July 2015. ^ "Pilot Training Fell Short in Virgin Galactic Crash, Investigators Say". The New York Times. 28 July 2015. Retrieved 28 July 2015. ^ "NTSB Report Cites Probable Cause Of SpaceShip2 Crash". Aviation Week. 29 July 2015. Retrieved 29 July 2015. ^ Burn-Callander, Rebecca (22 August 2015). "Virgin Galactic boldly goes into small satellites, telling future astronauts 'you have to wait'". UK Telegraph. Retrieved 2015-08-24. ^ "Virgin Galactic's space programme moves forward as SpaceShipTwo carries out first successful glide test". The Telegraph. 4 December 2016. Retrieved 2016-12-04. ^ Virgin Galactic Completes 1st Powered Test Flight Since Fatal 2014 Crash. Douglass Messier, Space. 5 April 2018. ^ Wattles, Jackie (15 December 2018). "Meet the pilots of Virgin Galactic's first flight to space". CNN Business. Retrieved 17 December 2018. ^ "Virgin Galactic successfully launches tourism rocket ship into space for first time". Sky News. Retrieved 2018-12-22. ^ a b Schreck, Adam. "Abu Dhabi partners with Virgin Galactic spaceship firm". ABC News. Retrieved 2014-06-16. ^ "Abu Dhabi's Aabar boosts Virgin Galactic stake". Market Watch. 2011-10-19. Retrieved 2014-06-16. ^ Kleinman, Mark (2014-06-12). "Google In Talks To Take Virgin Galactic Stake". SkyNews. Retrieved 2014-06-16. ^ Memorandum of Understanding Between Virgin Galactic, LLC and National Aeronautics and Space Administration Ames Research Center. www.nasa.gov. ^ "NASA Buys Flights on Virgin Galactic's Private Spaceship". Fox News. Retrieved October 14, 2011. ^ Peter B. de Selding (15 January 2015). "Virgin, Qualcomm Invest in OneWeb Satellite Internet Venture". SpaceNews. ^ Steve Dent (17 January 2015). "Virgin wants to launch 'world's largest' array of internet satellites". engadget. ^ Hugo Martin (3 December 2016). "Supersonic passenger planes may begin test flights next year". Los Angeles Times. ^ a b Justin Bachman (4 December 2016). "Colorado-based Boom Technology is bringing back supersonic. But will the airlines buy it?". Bloomberg News. The Denver Post. ^ a b Aiden Burgess (22 November 2016). "Boom Technology reveals commercial supersonic aircraft prototype with support from Virgin". The Manufacturer. ^ "Virgin Galactic and Under Armour partnership - collectSPACE: Messages". www.collectspace.com. Retrieved 2019-01-25. ^ In Year of Firsts, Virgin Galactic Names Alum as President. Alum.mit.edu (2013-07-12). Retrieved on 2013-08-27. ^ Jeff Foust (13 October 2016). "Mike Moses named Virgin Galactic president". Space News. ^ a b c d e f Virgin Galactic (9 June 2015). "Virgin Galactic – Introducing our Pilot Corps". ^ "Virgin Galactic selects Nicola Pecile as new pilot". 31 August 2015. Retrieved 5 April 2018. ^ "Spaceship Company unveils design of SpaceShipTwo". Pravda Online. January 23, 2008. Archived from the original on January 28, 2008. Retrieved January 25, 2008. ^ Branson, Richard (October 10, 2007). "My Friend, Steve Fossett". Time. Retrieved October 31, 2007. ^ Burack, Ari (October 10, 2007). "Sir Richard Branson, black robed as Father Richard for zany party inaugurating Virgin American flight from San Francisco to Las Vegas". San Francisco Sentinel. Retrieved February 28, 2008. ^ Nizza, Mike (October 11, 2007). "The Legend of Steve Fossett Takes Root". New York Times. Archived from the original on December 12, 2007. Retrieved December 20, 2007. ^ Kaila Hale-Stern (3 December 2015). "Virgin Galactic Announces New "Cosmic Girl" Mothership That Could Help It Compete With SpaceX". Gizmodo. ^ "SpaceShipOne rockets to success". BBC.co.uk. October 7, 2005. Retrieved February 2, 2011. ^ "New Branson bio examines delays and other problems with Virgin Galactic". Retrieved January 26, 2014. ^ "'Don't let more die', Richard Branson told". London Daily Telegraph. Retrieved November 8, 2014. ^ Carrington, Daisy (August 16, 2013). "What does a $250,000 ticket to space with Virgin Galactic actually buy you?". CNN.com. Retrieved August 17, 2013. ^ Wall, Mike (April 30, 2013). "Ticket Price for Private Spaceflights on Virgin Galactic's SpaceShipTwo Going Up". Space.com. Retrieved August 17, 2013. ^ Forgione, Mary (May 2, 2013). "Want a ticket to space? Virgin Galactic agents are standing". Los Angeles Times. Retrieved September 3, 2013. ^ Alan Boyle (March 19, 2012). "Ashton Kutcher set for space trip". msnbc.com. Retrieved March 19, 2012. ^ "Virgin Galactic Rocket Motor Milestone". Archived from the original on May 26, 2014. Retrieved May 23, 2014. ^ "SNC abandons own hybrid motors on Dream Chaser". Retrieved August 19, 2014. ^ "Captain Kirk signs on for Virgin Galactic Space Ride". soultek.com. Archived from the original on September 29, 2007. Retrieved February 14, 2008. ^ "Cracks discovered in WhiteKnightTwo's wings". Retrieved May 11, 2014. ^ a b "Virgin Galactic relaunches its smallsat launch business". NewSpace Journal. July 12, 2012. Retrieved July 11, 2012. ^ Amos, Jonathan (July 11, 2012). "Richard Branson's Virgin Galactic to launch small satellites". BBC News. Retrieved July 13, 2012. ^ a b Boyle, Alan (2014-01-23). "Hello, Newton: Virgin Galactic unveils its 'other' rocket engine". NBC News. Retrieved 2015-09-10. ^ Amos, Jonathan (November 10, 2009). "LauncherOne: Virgin Galactic's other project". BBC News. Retrieved July 13, 2012. ^ Rob Coppinger (July 11, 2012). "Virgin Galactic Unveils LauncherOne Rocket for Private Satellite Launches". Space.com. ^ a b Foust, Jeff (2015-03-16). "Virgin Galactic's LauncherOne on Schedule for 2016 First Launch". Space News. Retrieved 24 March 2015. ^ "Virgin Galactic Reveals Boeing 747 For LauncherOne." ^ "Virgin boosts rocket capability". 2015-09-15. 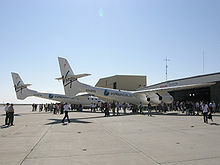 ^ a b "Virgin Galactic Acquires Boeing 747 for LauncherOne Missions". 2015-12-04. Retrieved 2015-12-04. ^ a b "Virgin Galactic FAQ: Where Will I Fly From?". Archived from the original on June 16, 2008. Retrieved June 26, 2008. ^ "Foster + Partners". fosterandpartners.com. Archived from the original on February 16, 2008. Retrieved February 17, 2008. ^ "Will Whitehorn (Virgin Galactic) and Heather MacRae (Venture Thinking) at the RAeS". space.co.uk. Archived from the original on October 21, 2008. Retrieved July 26, 2008. ^ "Runway Opens at world's first spaceport". BBC News. October 23, 2010. Retrieved October 22, 2010. ^ "NASA Selects SpaceX To Be Part Of America's Human Spaceflight Program". Space News. 16 September 2014. ^ a b Pasztor, Andy (2014-11-13). "Problems Plagued Virgin Galactic Rocket Ship Long Before Crash". Wall Street Journal. Retrieved 2014-11-14. (Subscription required (help)).